(Nanowerk News) Researchers have solved the long-standing conundrum of how the boundary between grains of graphene affects heat conductivity in thin films of the miracle substance -- bringing developers a step closer to being able to engineer films at a scale useful for cooling microelectronic devices and hundreds of other nano-tech applications. The study, by researchers at the University of Illinois at Chicago, the University of Massachusetts-Amherst and Boise State University, is published online in Nano Letters ("Bimodal Phonon Scattering in Graphene Grain Boundaries"). 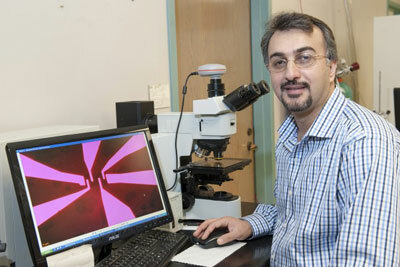 Amin Salehi-Khojin, UIC assistant professor of mechanical and industrial engineering. Since its discovery, graphene -- a single layer of carbon atoms linked in a chicken-wire pattern -- has attracted intense interest for its phenomenal ability to conduct heat and electricity. Virtually every nanotech device could benefit from graphene’s extraordinary ability to dissipate heat and optimize electronic function, says Poya Yasaei, UIC graduate student in mechanical and industrial engineering and first author on the paper. In a two-year, multidisciplinary investigation, the researchers developed a technique to measure heat transfer across a single grain boundary -- and were surprised to find that it was an order of magnitude -- a full 10 times -- lower than the theoretically predicted value. They then devised computer models that can explain the surprising observations from the atomic level to the device level. Graphene films for nanotech applications are made up of many tiny graphene crystals, says Amin Salehi-Khojin, UIC assistant professor of mechanical and industrial engineering and principal investigator on the study. Producing films large enough for practical use introduces flaws at the boundaries between the crystals that make up the film. Salehi-Khojin's team developed a finely tuned experimental system that lays down a graphene film onto a silicon-nitrate membrane only four-millionths of an inch thick and can measure the transfer of heat from one single graphene crystal to another. The system is sensitive to even the tiniest perturbations, such as a nanometer-scale grain boundary, says co-author Reza Hantehzadeh, a former UIC graduate student now working at Intel. When two crystals are neatly lined up, heat transfer occurs just as predicted by theory. But if the two crystals have mis-aligned edges, the heat transfer is 10 times less. To account for the order-of-magnitude difference, a team led by Fatemeh Khalili-Araghi, UIC assistant professor of physics and co-principal investigator on the paper, devised a computer simulation of heat transfer between grain boundaries at the atomic level. Khalili-Araghi's group found that when the computer "built" grain boundaries with different mismatch angles, the grain boundary was not just a line, it was a region of disordered atoms. The presence of a disordered region significantly affected the heat transfer rate in their computer model and can explain the experimental values. “With larger mismatched angles, this disordered region could be even wider or more disordered,” she said. To realistically simulate mismatched grain boundaries and natural heat transfer, it was necessary to model the synthesis of a large area of graphene film, with grains growing and coalescing -- a very complex simulation, Khalili-Araghi said, which required the "enormous computing power" of UIC’s High Performance Computing Cluster.